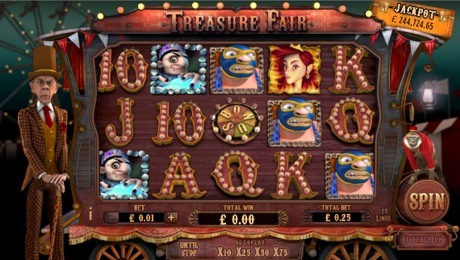 Treasure Fair is a 5 reel slot with three rows and 25 fixed paylines; the reels spin on the side of a traditional caravan with the ringmaster and the monkey watching on from the sides. Through the murky gloom in the background you can make out a big wheel slowly revolving. The gaunt gentleman and the squawking monkey on the plus side will deliver you loads of bonus features, exploding wilds and a massive progressive jackpot. This bonus feature is triggered by landing 3 of the bonus symbols on reels 2, 3 and 4. You will get to spin the Wheel Of Fortune which will determine which of 5 bonus games you will play and the multiplier attached to your win. The games are based on the 5 main characters and they are essentially all the same – you pick one of the icons on show to reveal a cash prize. This Video Slot has a progressive jackpot that is awarded randomly. No symbol combinations are necessary for winning. The probability of hitting a jackpot is determined by the size of the bet and number of selected paylines (25 fixed).